Sharing my love of sewing, knitting, beading/jewelry making, photography, paper crafts, cooking and baking. When my sister "E" was here for a visit I made her fur baby Tracey a coat for cold winter days and nights. She chose the same pattern as I did for Holly's coats here and here. I love the brown fleece against her fur. My fur neice looks so pretty. She was so excited when it was done and she ran into "E's" studio to show it to him. I'm so glad I got to sit down with my sister and teach her what I love. I hope she will be inspired. I am linking up with these parties and TCB. Aha, wish my cats will be as good as E. Such wonderful creations you have. Great post! How cute! 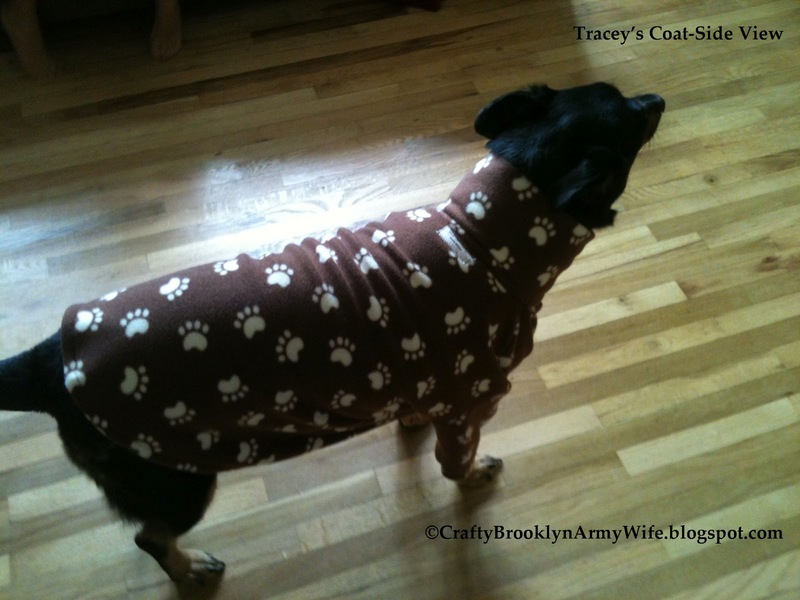 It looks so snuggly and comfy for the pup in the cold weather! Super cute! Thanks for following. I like to blog about what is important to me my girls, crafting, and gluten free foods. I hope you enjoy. Following you back. Love it - this is so cute. I wish my dog would wear one but he's a crazy Labra-mutt! Thanks for stopping by my blog and becoming a follower. I am following you back. So cute! Maybe I can make one for my "Dog-in-law" Louie! He loves to wear clothes. He is always quite proud when he gets a new sweater! cute coat. its so fun to have a little sidekick while sewing, I cherish my sewing time with my daughter too. Pretty cute & looks so cozy! Thanks for stopping by Alderberry Hill! So cute! My sister has a little dog she adores and I bet she'd love to keep her cozy this winter in one of these! Looks so cozy! 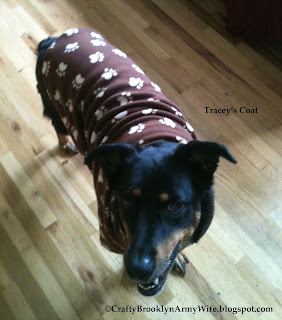 We used to put coats on out dog when she went for walks in the winter, they were never this cute though! Thanks for linking up at What's Cluckin! That is so cute! I wish I had a sewing machine. I'd be sewing all kinds of cute stuff too! How cute! I actually made a blanket for my dog out of the same fabric. Thank you for visiting my blog and becoming a follower. I hope you enjoyed your stay. I look forward to reading all of your comments. If you are a new follower, via Facebook, Instagram, Twitter, Bloglovin, Pinterest, and Linky Followers, please let me know and I will follow you back. Patch - RIP our sweet, loving fur baby and one-eyed wonder cat. 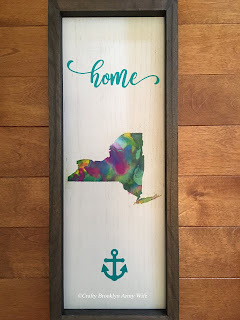 ©2014 Crafty Brooklyn Army Wife . Ethereal theme. Powered by Blogger.